To evaluate an intraparenchymal probe for intracranial pressure (ICP) and temperature (TEMP) monitoring as well as determination of cerebral hemodynamics using a near-infrared spectroscopy (NIRS) and indocyanine green (ICG) dye dilution method (NIRS-ICP probe). 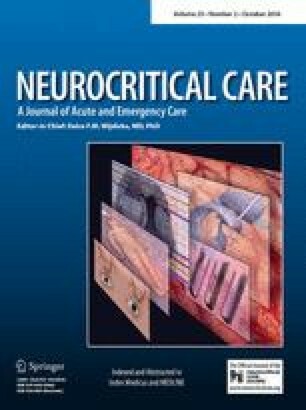 The NIRS-ICP probe was applied after aneurysmal subarachnoid hemorrhage if multimodal monitoring was established due to poor neurological condition. ICP and TEMP values were obtained from ventricular catheters and systemic temperature sensors. Repeated NIRS-ICG measurements (2 injections within 30 min) were performed daily for determination of cerebral blood flow (CBF), cerebral blood volume (CBV), and mean transit time of ICG (mttICG). Secondary neurologic dysfunction was defined as brain tissue oxygen tension <20 mmHg and/or lactate/pyruvate ratio >35 obtained from cerebral probing. A total of 128 NIRS-ICG measurements were performed in ten patients. The correlation coefficients between ICP and TEMP values obtained with the NIRS-ICP probe and values from routine monitoring were r = 0.72 and r = 0.96, respectively. The mean values were 30.3 ± 13.6 ml/100 g/min for CBF, 3.3 ± 1.2 ml/100 g for CBV, and 6.8 ± 1.6 s for mttICG. The coefficients of variation from repeated NIRS-ICG measurements were 10.9 % for CBF, 11.7 % for CBV, and 3.8 % for mttICG. The sensitivity for detection of secondary neurologic dysfunction was 85 % and the specificity 83 % using a CBF-threshold of 25 ml/100 g/min. Multimodal monitoring using the NIRS-ICP probe is feasible with high reproducibility of measurement values and the ability to detect secondary neurologic dysfunction. No safety concerns exist for the routine clinical use of the NIRS-ICP probe. The authors gratefully thank Dr. Rafael Sauter (Clinical Trial Unit, Kantonsspital St. Gallen, Switzerland) for his statistical support. M. Seule received grant support by the Stiefel-Zangger Foundation of the University Zurich, Switzerland. The project is supported by the Swiss Innovation Promotion Agency (project no. 13553.1PFFLM-LS), Eurostars (Project No. E!6526 OPTO-BRAIN), as well as by the Velux and von Tobel foundations. NeMoDevices AG (Zurich, Switzerland) provided technical equipment for this clinical trial. Prof. E. Keller has a financial interest in this work as founder and shareholder of NeMoDevices AG, Zurich, Switzerland.